BASSETERRE: Marlon Samuels produced his best batting effort in One-Day International cricket against Australia to lead the West Indies to a six-wicket victory in the fifth match of the Tri-Nation series at Warner Park in St Kitts on Monday. Set a challenging target after Usman Khawaja’s 98 and supporting half-centuries from skipper Steve Smith (74) and George Bailey (55) lifted the visitors to 265 for seven batting first, the enigmatic Samuels stroked 92 to ensure that the target was reached with 20 deliveries to spare. “It’s all about delivering for the team and keeping us in contention in the competition,” Man of the Match Samuels said. With a previous best of 63 from 27 ODIs against the most dominant team in this form of the game, the Jamaican right-hander made an important deposit on a significant overdraft against the World Cup-holders, his innings spanning 87 deliveries and decorated with eight fours and four sixes — the last three of which came off consecutive balls from leg-spinner Adam Zampa over long-off. In keeping with his mercurial nature, he was run out off the very next delivery to have the West Indies at 240 for four in the 41st over. Two more wickets fell to Nathan Coulter-Nile with the score at 254 before Kieron Pollard and Carlos Brathwaite formalised victory in the 46th over. Denesh Ramdin also played a key role in the run-chase. He supported Samuels in a 73-run fourth-wicket stand and continued to play sensibly following the demise of his senior partner before being bowled by Coulter-Nile for 29. 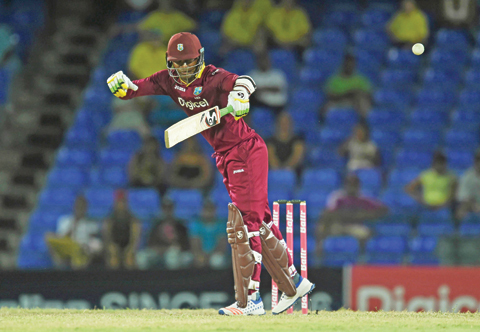 Victory pulled the West Indies within a point of leaders Australia in the three-team standings. West Indies next play South Africa on Wednesday at the same venue. Samuels had joined Darren Bravo at the crease following a rollicking opening stand of 74 in ten overs from Johnson Charles and Andre Fletcher. Both benefited from dropped chances by Khawaja before all-rounder James Faulker removed Fletcher for 27 while Zampa trapped Charles in front for 48. Bravo and Samuels then steadied the West Indies chase, keeping them well on course in an 82-run third-wicket partnership that was broken when Zampa was summoned back into the attack and removed Bravo for 39 via at bat-pad catch that lobbed comfortably to wicketkeeper Matthew Wade. Earlier, Khawaja’s promotion to open the batting in the absence of the injured David Warner paid immediate dividends. He lost Aaron Finch in the very first over to West Indies captain Jason Holder but then featured in a 170-run second-wicket partnership with Smith, who overcame the nagging discomfort of a right leg injury to help put his team in a commanding position by the time he departed in the 35th over, the victim of a clever change of pace from all-rounder Carlos Brathwaite. Khawaja was on the verge of a maiden ODI hundred but, becalmed in the nineties, he took on the challenge of a third run for his third-wicket partner, Bailey, and was found short of his ground by Jerome Taylor’s return from the boundary to stand-in wicketkeeper Fletcher. His innings occupied 123 deliveries and was embellished by three sixes and four fours. Fletcher’s position behind the stumps was the result of an injury to Ramdin who fell heavily on his right shoulder when attempting to effect a run out a few overs earlier. He returned for the final overs, taking two catches to dismiss Travis Head and Bailey off Pollard.